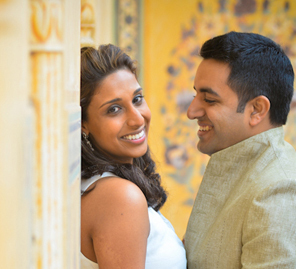 Bright colors and happy spirits defined this couple’s wedding. Kritika and Aakash may have met each other in a typical setup, but their story is far from usual. 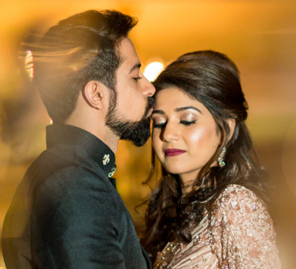 The bride shares with us how they discovered love and the pictures from their wedding clicked by WeddingSutra Favorite Movie'ing Moments. It was an arranged marriage setup but from the moment we saw each other, there was zero awkwardness. In fact, we were both eager to get to know each other better and as we talked we realized we had a unique connection. When we shared this with our loved ones we ended up with two extremely excited families looking forward to the big shaadi ahead! It was a long distance relationship at first, but we managed to meet every two weeks. As the months passed we grew all the more confident in our decision. We developed such a strong bond that this didn't feel like an arranged marriage at all! We were engaged in ten days and exchanged vows four months after. Having met him, I can firmly refute any myth about arranged marriages being boring. I don’t think I could have found a better boyfriend than the husband my parents found for me. Our functions were spread across various venues; Holiday Inn Jaipur City Centre was the location for our mehndi and sangeet and the Rajasthani Carnival took place at Kabra Farm. 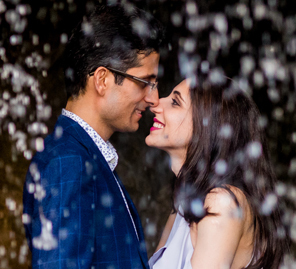 The wedding was held at Taj Jai Mahal Palace with its 18 acres of landscaped Mughal gardens, a luxurious venue fit to host all our loved ones on one of the biggest days of our lives. We knew that we would need an event planner to put the whole affair together, so we entrusted Rajjas Events with the responsibility. 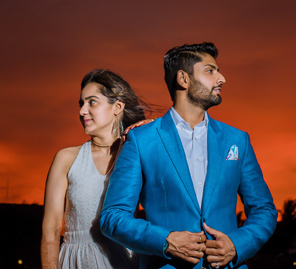 Photographs are the only way to relive this special day and Movie'ing Moments captured all the special moments for us from all our wedding functions. My makeup was done by Joynie Ruwngtol who goes by the name Makeup By Joynie. With its Punjabi theme, our mehndi showcased all things bright and beautiful. The colorful set up included a bar with signage that read ‘Pyaase Da Koona’. Bhangra dancers brought in an authentic northern vibe and the event was filled with cheer and made for the perfect start to our festivities. I wore a yellow lehenga by Peppermint Diva by Deepika which I paired with floral jewellery from Petal Jewels by Nikita. Aakash opted for an outfit by Govinda Mehta. This event was held outdoors with blue and white as the palette for the evening. The event saw a few dance performances by our loved ones after which we moved the party to a banquet where our guests were treated to some soulful Sufi music. Asif and crew performed and charmed the audiences with their spellbinding repertoire. I wore a gorgeous gown by Dolly J while Aakash chose a black Indo-Western ensemble by Study by Janak. It was the most fun event! The carnival took place at a farmhouse we had done up with a quirky, vibrant design concept inspired by Rajasthani culture. There was Rajasthani specialty food and fun activities like palmistry, kite flying, a balloon shooting game, a camel cart and so on. Our guests had a gala time participating in everything we had planned! For this event, I wore a lehenga by Papa Don't Preach by Shubhika and Aakash, once again went with a Study by Janak creation. The wedding decor was all about recreating the charm of regal weddings of the past. We had large orange gazebos, and glass chandeliers and our mandap was smothered with fresh flowers. I stuck to the traditional bridal color palette with a deep red lehenga from Om Prakash Jawahar. Aakash paired his Study by Janak sherwani with polki buttons, kalangi, and kantha from Raj Jewels, Jaipur.